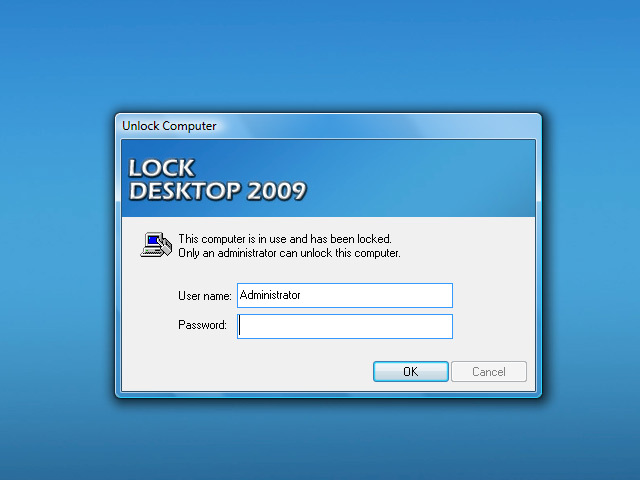 Lock Desktop 2009 effectively disappoints intruders by protecting your PC from unauthorized entry. The program's functional interface provides multiple options to customize security settings. If you're the administrator, it gives you the advantage of customizing some Registry settings, including hiding the Windows Shutdown menu and the Control Panel. You may need to restart your PC after applying changes. You also can enable/disable download and boot keys, and restrict other users from modifying program settings. A customized message and background can be displayed during lock mode. You can lock your PC on demand and it records any unsuccessful login attempts, You can also use an auto-lock feature by using the program screen saver to add another layer of security if the computer is left unattended. Restarting the PC easily overthrows security efforts of similar tools, but Lock Desktop 2009's option to load at start-up keeps your system safe. Plus, it can't be uninstalled without the administrator password. Lock Desktop 2009 makes a good security tool for guarding your PC against nosy onlookers or would-be intruders. This site does not contain serial number, crack, keygen Lock Desktop 2009 serial number : serial number is the simplest type of crack. A serial number(cdkey,product key,etc) is register the program as you may already know. a crack or keygen may contain harmful software. If you cannot find the exact version you want, just give it a try. for more information read .nfo/.txt/.diz file include in zipped file.